This is a detailed review and measurements of the popular Schiit Modi 2 Uber DAC and comparison to Topping D30. I own both units. The Modi 2 Uber edition is one of the three versions of this DAC and retails for $149 plus shipping. The Topping D30 is available on Amazon Prime for $119 and includes shipping so good bit cheaper. The two are similar in features in that both have three inputs: USB, S/PDIF coax and Toslink optical inputs. Both have external power bricks. The Topping has its power switch on the front which I prefer to the back switch of Modi 2 Uber. I also like the English labels on Topping as opposed to alien symbols used in Schiit Modi 2 Uber. A while back I reviewed the plain Modi 2 and unfortunately it did not perform well. This prompted people to ask me to measure the Uber edition since it has an external power supply and as such, should not be affected by the USB power as Modi 2 was. The Topping D30 was also reviewed earlier but this is an extended set of measurements than I used to perform then. Fortunately the levels in #1 and #2 from audibility point of view are pretty low so not a major concern. Just lack of good engineering at play. We see that the Modi 2 Uber has much higher noise at lower frequencies (< 6 kHz) where our hearing is most sensitive. It also has higher harmonic distortion spikes than Topping D30 with the exception of 5th harmonic. We see that the Modi 2 Uber underperforms Topping D30 by 7 dB. But wait, there is more! As I was running this test the bar graph kept jumping from time to time when analyzing Modi 2 Uber. I was puzzled by this so tested the Topping D30 again and it was rock solid. As you see, Modi 2 Uber min THD+N is -96 dB but then increases way up to -59 dB (smaller numbers are worse). The D30 on the other hand only varies between -103 and -102 dB. Bottom group of graphs shows the lower distortion level. But once in a while, the distortion and noise jump up as shown in green and yellow. So clearly something is wrong. Way wrong. I then hooked up the Modi 2 to my Stax headphone amp and listened. The problem became super obvious: the DAC would play the 1 kHz tone cleanly for some 8 to 10 seconds and then there would be a soft glitch/static. Sometimes it would do this once. Other times it would do it twice and once it did it three times in a row! I then tested the S/PDIF input using my generator as the source and there was no glitch at all. This leads to the conclusion that the Schiit Modi 2 Uber has a broken USB implementation. This is completely repeatable on my system. Before any owners say they have this unit and don't have this problem, I played a bunch of music with the DAC and I could NOT detect the glitch there. Whether it was masked by music or is a problem that occurs at 0 dBFS, I don't know. What I do know is that in identical situation with dozens of DACs including the Topping D30, this problem does not occur. The Schiit Modi 2 Uber turns in pretty poor performance. Using my self-imposed 0.1 dB error limit, it is only able to output a signal that is less than this error at 72 dB and higher. This translates into 12 bits of clean output. The Topping D30 on the other hand marches on to -90 dB which is equivalent to 15 bits. This is significantly better performance than Schiit Modi 2 Uber. The picture is even worse than that. At -120 dB, the error from Schiit Modi 2 Uber is 15 dB. 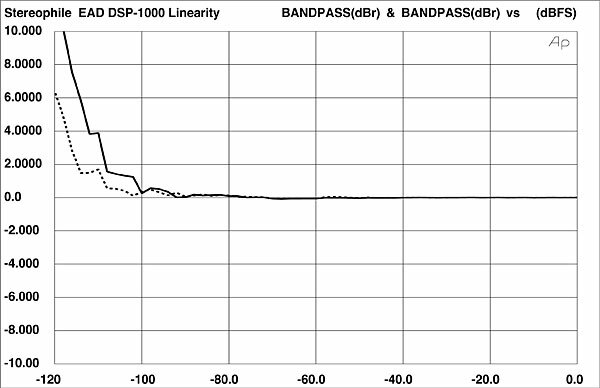 At the same level, the Topping D30 error is just 2.5 dB. While the Modi 2 Uber sine wave is pretty clean, its level has dropped by a fair bit which reflects poorly in linearity tests (noise dominates over the signal). I could run more tests but I think the picture here is quite consistent in each measurement. Schiit Modi 2 trails the Topping D30 by a significant margin. I connected both DACs to the inputs of my Stax SRM-007t driving the Omega pro headset. Using its AB switch I could instantly go between the two DACs while Roon played the same music to both. There was no comparison here: the Topping D30 had far more authority, detail, bass impact, air, etc. In every way it was superior to the Schiit Modi 2 Uber. A child could tell the difference. What is that you say? You thought DACs don't sound very different? Well, that is the case if you match their levels. The Topping has nearly 3 dB higher output than the Schiit Modi 2. So if this is not compensated for, the extra level absolutely translates into better fidelity. Why did I run the test knowing what I know about the levels? This was to dispute the subjective tests online where people say Topping D30 doesn't sound as good as Schiit Modi 2 Uber. That is an impossibility since their testing is like above without level matching. If they can't hear the louder DAC, i.e. Topping D30 sounding better, they need to turn in their audiophile card. It is simple as that. To match levels, I used the Roon DSP volume control and notched down the Topping D30. Unfortunately the resolution was too coarse. I could either have it be a bit louder than Modi 2 Uber or a bit less loud. Regardless, almost all of the above differences I heard when I didn't level match went out the window. Both DACs sounded pretty good. Trying hard I thought the Schiit Modi 2 Uber sounded a tiny bit brighter. This is not a very reliable observation so please don't hold me to it. The measurements show that the Schiit Modi 2 Uber DAC is simply not competitive in performance. It has lower output, higher noise and jitter and much worse linearity than Topping D30. Worst yet, its USB implementation appears to be faulty causing glitches in the output. Time and time again when I test Schiit products they demonstrate lack of design verification and targets. The basics are not done. Just aren't. The company needs a reboot in its development process and must establish competitive targets and strive to achieve them in new products. Just because a product produces music, it doesn't mean it is working correctly. Fortunately our hearing is nowhere as sensitive as our instrumentation. So if you own a Modi 2 Uber, I am not telling you to run out and buy something else. But if you are in the market for a new DAC, I am compelled to recommend buying a different product whether that is Topping D30 or other DACs in this price range. They have all gone though proper engineering and design verification to produce performance that at least meet the CD specification in noise and resolution. In this case UBER SCHIIT. Nah. McDacs are at least real beef. The Schiit DACs come from the nether end as in bull Schiit! But Magni 3 and O2 review/comparison soon, @amirm? It'd definitely go well with the recent reviews/comparisons like this one. Amirm, do you think Topping would benefit from a linear power supply? But Magni 3 and O2 review/comparison soon, @amirm? Thanks. Note the the linearity measurement was made using S/PDIF so even there, performance of Modi 2 Uber is not competitive. As you see, the low frequency noise components can be removed but the random jitter cannot be eliminated. From memory, I tested it and it did make a small improvement. But it is not an audible difference. So I would not bother. oh wow, I had assumed the random jitter had something to do with their usb receiver, but it happens regardless of input. You've got a typo (why do these things stick out like neon to me and others read along and don't notice? One of the mysteries of life).
" ... The Topping D30 on the other hand marches on to -90 dB which is equivalent to 15 db. ..."
... equivalent to 15 bits. why do the modi measure good here, but not in your measurements? Thanks. I made the correction. It is one of those things when you write something, you read it the way you want, rather than what it is . Thanks for the link. Let me start by saying that I am happy to see others measure and try to replicate my measurements. Agree or disagree, it is a good thing to see more people paying attention to such data. This seems to show that the Schiit Modi 2 Uber is doing well. But it may not be. Let's step back and understand this measurement. The system generates digital audio samples and then keeps reducing their values and measures the analog output of the DAC. If I halve the digital sample value for example, the analog output of the DAC better follow. Any variation is an error from ideal performance of a DAC. If we plot the input digital sample values against the output analog voltage, we would get a graph like they are showing above. An ideal DAC would have a perfectly flat line. So what is the problem in the above graph? Lack of resolution. We are traversing some 120 db in so few pixels. So it is hard to see any deviations. For this reason, the standard linearity graph does NOT show the above line. Instead, we show the error from ideal value. Since the error range is small, we can zoom way in and see any variations. The green lines are the same as what they are showing. As we see, they look of similar. But look at the red line which shows the error. In the case of Schiit Modi 2 Uber on the left, the error starts at just -72 db. Look at the part of the green graph and you cannot with naked eye see that kind of error. One would think that the green line is perfect up to some -110 dB but that is not remotely the case. Alas, not all measurement systems can show the deviation graph. Without it, the linearity information is next to impossible to interpret except for extreme cases of errors. So in summary, their graph may very well be in full agreement with mine. It is just that it is impossible to see it there. Wrong presentation for this type of data. Notice that it is only showing the error graph just as I do. Oh, I understand completely when you're the author. There were a number of comments and I'm sure many readers who didn't comment, before I posted though. Not much gets by many of the active posters here but typos seem to be one. In my normal web-surfing habits, I send a lot of eMails to webmasters who operate professionally designed and edited sites, often large corporations who presumably get good help at presumably good salaries. Yet I see every one. For some reason, news sites are the worst, but I don't bother notifying them. It's their job, and if they do it poorly, they deserve to have it hang out there for everyone to see. But a site like this, unpaid and community based, I will, because as part of the community I feel it's upon me to help. I had a boss, husband & wife team, and there was a large post-and-beam hall where you needed four tiers of scaffolding to change the light bulbs. She could see spider webs in the farthest corners of the building from 80 feet away, and would direct people to brush them off. I once mentioned to her about her "excellent vision" and she replied "It's not a skill, it's a disease." What do you make of the FFT measurements showing the humps at 9kHz and 15kHz on the 12kHz tone chart for the D30 and the higher noise floor of the D30 in comparison to your measurements? So, D30 has 18-bits resolution on its USB input and only 15-bits resolution on SPDIF input?